A time lapse video of the developing nervous system of a zebrafish embryo has won Nikon’s Small World in Motion competition. It narrowly beat a video of a laser beam propagating inside a soap membrane to the top spot. 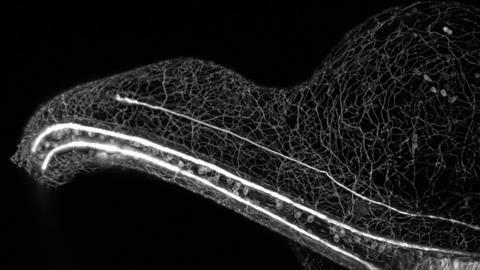 Elizabeth Haynes and Jiaye He from the University of Wisconsin–Madison, US, shot the winning video of the developing zebrafish over 16 hours using selective plane illumination microscopy. They were studying the role of kinesin light chain genes in the immature nervous system of the zebrafish, which could potentially help understand neurodegenerative diseases such as Alzheimer’s. Runner-up Miguel Bandres from Technion, Israel Institute of Technology used reflected light microscopy to capture laser light interacting and scattering inside a soap membrane. Other videos that received an honourable mention featured soy sauce evaporating and a daphnia water flea giving birth. Nikon’s photomicrography competition has been running since 1975, with the Small World in Motion category added in 2011.